Chocolate, peanut and marshmallow swirl cupcakes! Give me s’more! Did you ever enjoy s’mores as a child? 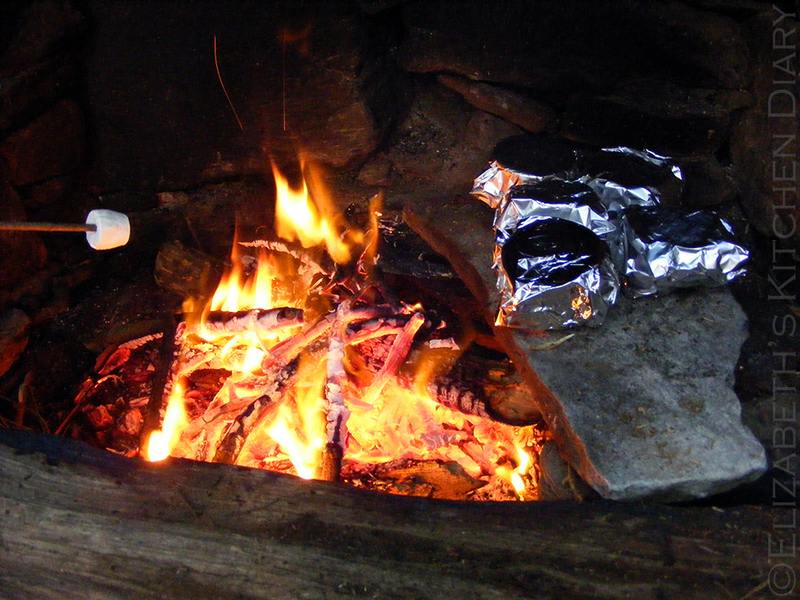 Picture it, an open camp fire, two graham crackers smeared with peanut butter, chocolate chips pressed into the sticky peanut butter so that there were no gaps at all, two or three giant marshmallows stuck on the top and then the two graham crackers sandwiched together, squeezing the marshmallow flat. Wrap it all in tin foil (I’m Canadian, I can say this! ), and carefully place in a hot area near the fire so that the chocolate and marshmallows melt into ooey-gooey awesomeness. Leave to cool slightly, if you can wait… and eat! Oh I miss proper s’mores! We don’t have graham crackers in the UK. Digestive biscuits are a reasonable alternative, but they are circular. S’mores need to be square. They don’t do proper Canadian-style marshmallows here either. Ach well – we must make due! There are many different ways of making s’mores. The above is how I was taught to do it at the annual children’s summer camp I attended from the ages of 7 until I was 14. Such fond memories. This cupcake recipe pays homage to the s’mores of my youth. These delicious cupcakes are made with cocoa powder and fat reduced peanut flour instead of peanut butter. I wanted a proper peanut hit with this recipe, and the peanut flour works well. Mini marshmallows add the final touch. The chocolate and peanut swirl cupcake itself has a gorgeous moist crumb, and the soft chocolate and peanut swirled frosting is just… heavenly! To make the swirl effect frosting you can either spoon the mixture on opposite sides of a large piping bag, or to make things a little easier, use three small plastic disposable bags. Put the chocolate frosting in one, the peanut frosting in the other, and then put both bags into a third bag fitted with a medium sized star piping nozzle. I’ve only put a small amount of frosting on the tops of these cupcakes, but if you’re a frosting fan by all means double the quantity and pile it up! This post has me all nostalgic for the Canadian summers of my youth – twinkling fireflies, the peeping of the frogs in the local ponds, bats, june bugs banging against the screen windows and even mosquitoes! Ok, not so much mosquitoes. The weather here in Shetland has been terrible this year. I fear that we won’t get a summer at all! It’s midway through June and I’m still wearing heavy jumpers and a scarf! Please, please, please ye old weather gods, bring us a summer! I can not be held accountable for my erratic behaviour if the sun does not shine to rejuvenate me! In the meantime, here’s the recipe for the cupcakes – suitable for indoor eating when it’s raining outdoors and you can’t build a campfire to make real s’mores. Chocolate and peanut cupcakes with a chocolate and peanut swirl frosting, topped with mini marshmallows! Preheat your oven to 180 C (170 C fan) and line a 12 hole muffin tin with large American size cupcake/muffin cases. Cream butter and sugar together until light and fluffy. Add the egg, one at a time, with a spoonful of flour so it doesn't curdle. Sift in the remaining flour and bicarbonate of soda and combine well. Divide the mixture into two equal portions in separate bowls. Add the cocoa powder to one half, and the peanut flour to the other half. Add a tablespoonful of milk to each bowl and stir until combined. It should be a soft, dropping consistency. Drop small spoonfuls of each flavoured batter into the cupcake cases. Using a knife or skewer, swirl the batter together slightly to make a marbled cupcake. Bake for 20-25 minutes, until springy and a skewer inserted comes out clean. Transfer to a wire rack to cool completely. To make the frosting, blend the butter and icing sugar together until thoroughly combined. Divide the mixture into two bowls, and add the cocoa powder to one bowl, and the peanut flour to the other. Add 1 tbsp milk to each bowl and combine well. 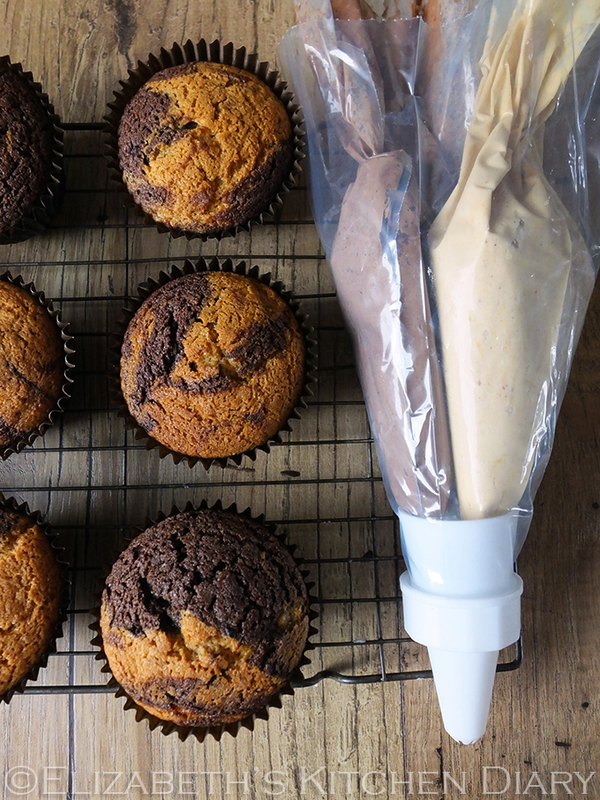 To pipe the swirled frosting you can either spoon each flavoured frosting into separate sides of a large piping bag, or use two small plastic disposable ones inserted into a third bag into which the medium star piping nozzle is fitted. Frost and decorate with mini marshmallows! With thanks to Sukrin for the peanut flour used in this recipe. Oh I now know what the deal with smores is. Defo yummy. I WANT to try your s’mores Elizabeth. I’ve heard about them vaguely before, but now you’ve described them so well I really really want some. Your cupcakes may not be the real thing, but they do sound rather good too and your multi swirling technique is very effective. Thanks for joining in with We Should Cocoa and I’m crossing fingers you get a good bit of sun in the months to come. Absolutely genius! Thanks for entering #weshouldcocoa! Oh my gosh! These look incredible! Love the frosting!! Ha ha ha! I agree, s’mores need graham crackers and a round biscuit is no substitution! Great recipe! Wow, look so delicious. Good recipe. Thank you Joyce 🙂 It’s great when an idea just works! My daughter’s eyes lit up when I told her about these! I didn’t know you could get peanut flour. I’ll have to look out for it as my husband loves peanuts. Mine came from Sukrin – it’s really a great product and I’ll likely be regularly stocking it in my pantry. Much better to cook with than peanut butter. mmmmm these look so yummy! These are the most delicious sounding cupcakes in the world!! YUM! Heehee, thank you Nicole! 🙂 Glad you like the look of them! I absolutely love s’mores! I’ve blogged about my adventures making them in the UK, and how I’ve missed them since moving here from Canada. Your cupcakes look amazing, and I love the addition of the peanut flour. Wow, these little beauties look fantastic! I’ve never heard of peanut butter on a s’more, but it sounds amazing! I’m going to give it a try around our fire pit tonight! Real s’mores have peanut butter on them. Anything else is a fake. 😉 I hope you do try it – you’ll never go peanut butterless again once you do! Make them! 🙂 You won’t regret it! What fab looking cupcakes and a great tip on how to pipe the two colours together. Thanks Jean, I’m glad you found it useful! I love smores cupcakes! Those ones look so delicious! These cupcakes are too pretty to eat – but that won’t stop me! So gorgeous, love these! Pinned, too. I am completely in love with these and the dual icing just takes them over the top!! Wow, these cupcakes just made my heart go pitter patter. I love Smores! Aw thank you Heidy! 😀 Glad you like the look of them! These look divine! And the dual frosting and marshmallow topping is a fun touch! Thanks Matt – I thought it would add to the whole cupcake experience, and it does! Is it sad that I have never ever had smores? Ooh how awesome.. We make s’more lots and this sounds like a great recipe. These look amazing ELizabeth. I could really do with one right now. Love the dual frosting too. I have never had a S’more cupcake, but so want to try one now! They look utterly decadent and delicious! Smores and cupcakes make for the perfect dessert recipe. You have done a wonderful job with this recipe. Nettie Moore recently posted…30 Amazing Appetizers That Will Rock Your Party! LOVE s’mores – these look so delicious! S’mores are one of the greatest foodstuffs ever created, imho! 🙂 Thank you! 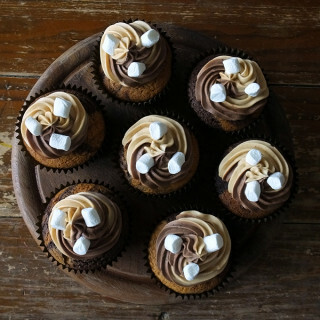 I love cupcakes and I love smores… no more words needed other than…..DIVINE! I love how you made the two tone swirl. Very creative. I bet these are scrumptious plus they bring back memories. YUM. What a fun and delicious idea. I didn’t grow up with ‘smores but I was addicted to toasting marshmallows over a gas burner (safety must have been relaxed at my house growing up). I love the taste of slightly charred marshmallows! Your cupcakes look a lot more sophisticated of course – just delicious! 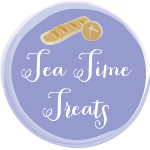 Thanks for linking with #CookBlogShare and so excited to catch up with you on Food Blogger Connect! These cupcakes look so delicious! 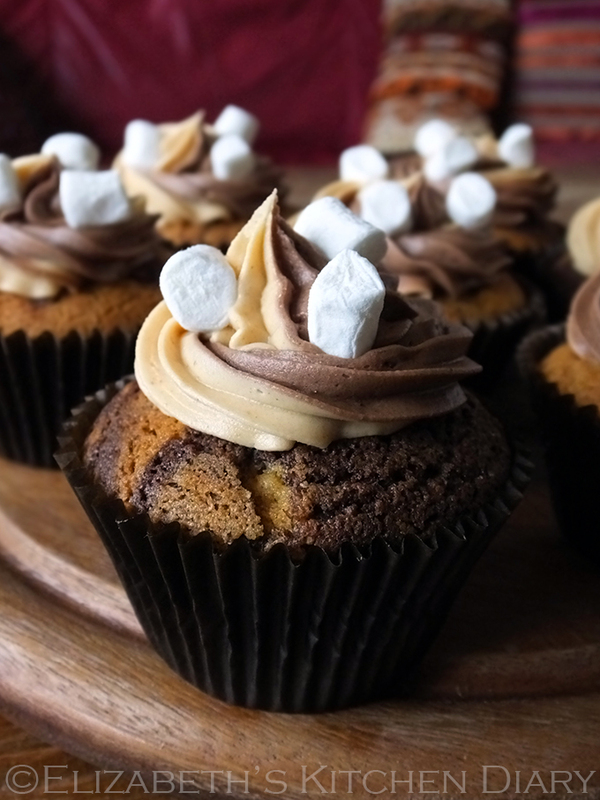 We always make s’mores while camping, but a cupcake version would be great to have all year round. Thanks Cindy – I agree. 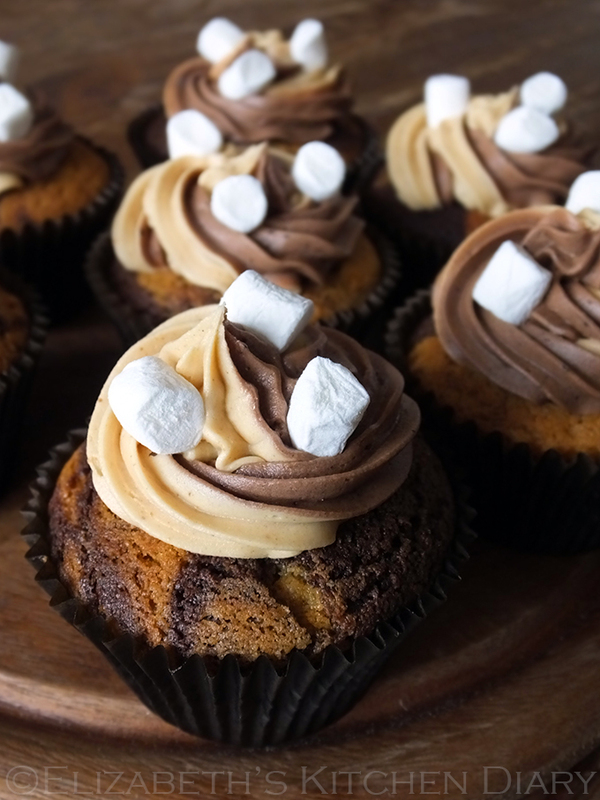 S’mores aren’t always available for making, but cupcakes are! The next s’more I have I will think of you:) Sadly all the bats are pretty much gone due to white nose fungus so I haven’t seen a bat in a couple of years. The junebugs and mosquitoes though will never die and they are put in full force!! I am headed to camp in a few weeks so will have an extra s’more for you! I’m so sorry to hear about the bats! 🙁 Please do have an extra s’more for me when you go camping! Looks gorgeous and I am sure the cupcakes taste even better than they look ! Thanks Linda, I was really impressed with how well the cupcakes turned out. It’s nice when an idea works! Thanks Dom, and camping in Colorado sounds amazing! I’d love to camp there one day. OMG they look amazing, I really want to give this a go!!!!! Thanks Melanie 🙂 They’re really easy to make – give it a go! These look so good and what fab photography! I’m useless at cupcakes but I think I’ll have togive this recipe a go!